A Nice Place to Visit! A Great Place to Live! 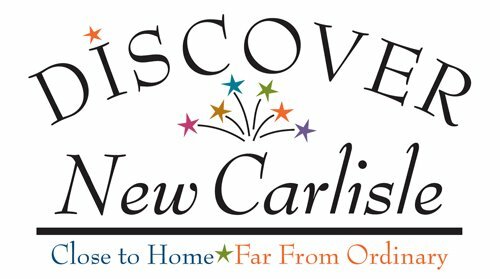 Discover New Carlisle is a community organization that encourages and develops local economic growth. Discover New Carlisle endeavers to create a vibrant community, develop economic growth and awareness of the community for its residents and businesses and become a destination for visitors by promoting and supporting local businesses and natural resources, through community pride, historic identity, grants, and special events. Whether you are a resident or simply passing through, there are many things to do and become involved in. We encourage everyone to stop by, participate, and enjoy our community. Discover New Carlisle regular monthly meetings are held the 2nd Monday of each month from 5:30 to 6:30 p.m. EST, at The Old Republic, 304 East Michigan Street. The Public is welcome. The Town of New Carlisle has placed an emphasis on history and historic preservation. The downtown and adjoining residential area were listed in the National Register of Historic Places in 1992 and features many beautiful late 19th and early 20th Century architectural styles and types such as Italianate, Queen Anne, Prairie, Four Square, Colonial Revival and bungalows. Many owners have beautifully preserved and/or restored homes and building in the community adding to the historic character and charm of the town. Historic New Carlisle, Inc. a not-for-profit historical society was organized in 1989 and has worked to preserve New Carlisle's history and it's built environment. In 1998, Historic New Carlisle, Inc. purchased and began rehabilitation of the Old Republic, an 1860 home built for businessman Jeremiah Service and his family. The Italianate home was almost torn down, but now stands proudly at the eastern gateway to the Town. The Old Republic houses a local history museum and Historic New Carlisle's office and can be rented for special events. Historic New Carlisle, Inc. continues to promote historic preservation through walking tours, workshops and technical assistance for owners of historic properties that may need help finding contractors and suppliers. Please contact us for more information regarding local businesses, history and preservation efforts in our community.